"Lammina" is the first series of reliable aluminum tenders or inflatable boats with a rigid false bottom, designed primarily for the US market. The 3.17 mm thick aluminum bottom plate gives these inflatable boats exceptional strength and lightness, making them ideal light tenders on lakes, rivers and around the rocky shoreline. In such conditions, the aluminum bottom helps the inflatable boat resist when meeting with stones, corals or large pebbles of the beach. Unlike the usual aluminum inflatable boats, all Lammina models retain their buoyancy even when the airbag located between the surface plate and the floor is flooded. 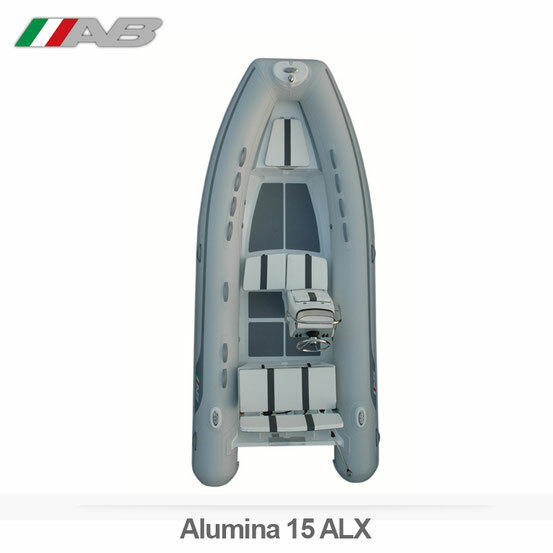 When there are developments such as an inflatable boat with a laid-on aluminum bottom “Lammina”, one should not be surprised that AB has a reputation for innovation. The described models are available in lengths from 2.5 to 4.5 m.
The 15 AL boats were originally designed for the Venezuelan army. Created for serious trips, they have the best ratio of length to habitable space for a given diameter of cylinders, which allows these inflatable boats to move in water with unsurpassed grace with a complete sense of safety and freedom. High-strength aluminum patch bottom made it possible to create a durable and lightweight inflatable boat that behaves well on the lake, on the river and among the reefs and the rocky shore, where the aluminum bottom helps to protect the cylinders from impacts on rocks, coral reefs and pebbles of beaches.